well written, thoughtful with lots of history and personal stories. 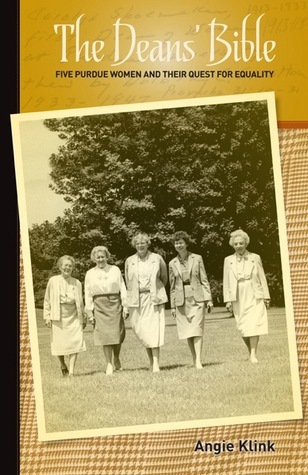 This book is the fascinating history of the first 6 deans of women at Purdue University. It is both a story of the women and a history of the fight for equality at an institution of higher learning. These women were incredible. I wish I had known them. It is a particularly interesting book to anyone who has attended Purdue or been affiliated with the university in any way. I did not attend Purdue, but I have lived in Lafayette for 23 years and am very familiar with the university. There was a lot of great history of the university in this book that I had never known. Add to that historical figures like Amelia Earhart, Earl Butz, and Lillian Gilbreth to make the book even more interesting. My book club really enjoyed it. Excellent book about 5 women who made a male-dominated Midwestern university a place where women could thrive, both as undergraduates and as faculty members. In a larger world, they served as leaders in the military, on presidential commissions for the status of women, and in the national association of Deans of Women. They were remarkable in their support of each other, even in retirement. They were a "chosen family". Angie Klink does a superb job bringing their stories of perseverance and integrity to life. A skillfully woven look at the history of great women who not only made significant contributions to the campus of Purdue University, but also to generations of women around the globe. A history of Purdue University, the Greater Lafayette Area and U.S rolled into one. Contains gems of how to bring about change useful even today. These women lived in a man's world while remaining women. Angie Klink - Angie Klink writes from the sleeping porch turned office of her circa 1900 home in Lafayette, Indiana. As she looks out onto the heart of the city’s downtown along the Wabash River with the Tippecanoe County Courthouse dome a beacon on the horizon, she writes about lives worth emulating. Her most recent book is "The Deans' Bible: Five Purdue Women and Their Quest for Equality" published by Purdue University Press, March 2014. She also authored "Kirby’s Way, How Kirby and Caroline Risk Built their Company on Kitchen-Table Values," published by Purdue University Press, July 2012, Angie is honored to bring to life two pioneering Purdue educators who improved the lives of American women in her book "Divided Paths, Common Ground." She authored the popular children’s books "Purdue Pete Finds His Hammer" and "I Found U." Angie is published in "Republican’s Soul," "The Gift of Christmas," "Chicken Soup for the Sisters Soul 2" and "Chicken Soup for the Soul: Just for Preteens." Angie writes advertising copy, essays and profiles. She has won 52 American Advertising Federation ADDY Awards and an honorable mention in the 2007 Erma Bombeck Essay Contest. She has a BA from the Brian Lamb School of Communication, Purdue University.